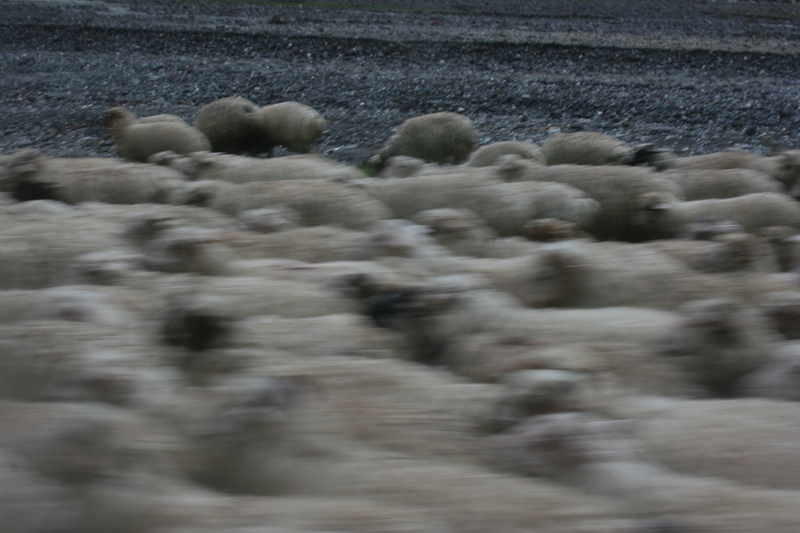 A day in the Caucasus | ride. travel. live. A quick flashback to May 2010. . . The weather had been bad in Tbilisi, with heavy rain for an entire day that turned the river into a muddy mess, flushing all sorts of debris, trash, and a dead cow or two downstream. I wisely decided not to head to the Kazbegi area for the day, instead, I took advantage of a break in the weather the next day and figured that I could at least get in a quick visit to the region. 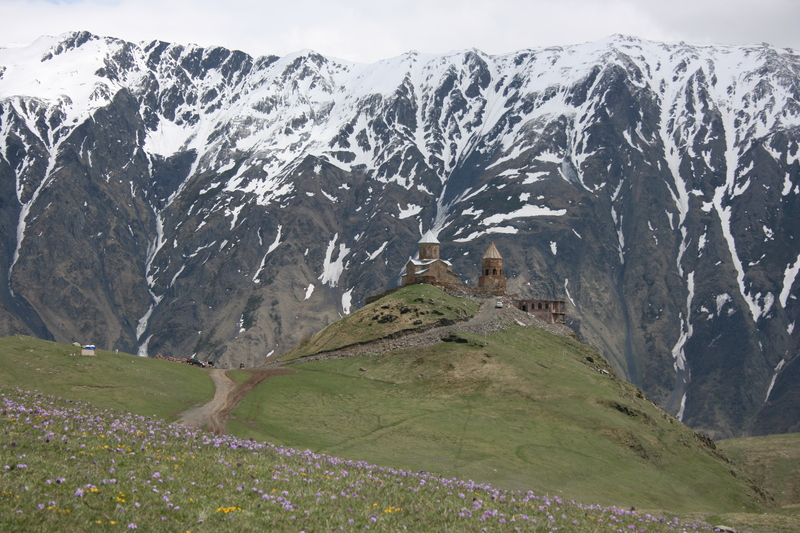 Alas, it was my last full day in Georgia, and having come all this way, it would be a shame to miss what is perhaps the most famous sight in the country, the Gergeti Trinity Church, a 14th century church overlooking the spiky peaks of the Caucasus. It’s a three hour journey north from Tbilisi on the famed Georgian Military Highway, on a mostly paved road of greatly varying quality. The road is fine from Tbilisi to Mtskheta, and OK up to the ski resort of Gudauri. Following the tunnel, the road deteriorates into a potholed slippery gravel and mud track, crosses the Jvari Pass at 2379 m, and then down towards the village of Stepantsminda (Kazbegi). And here is the starting point for the trail / road to the church. The pass was socked in and rainy, and I was stuck in the middle back seat without a view. I was lucky and got a three-hour window of dry-ish weather, and even a bit of sun, before a nice dumping of heavy rain on the way down. The trail was not signposted, but was fairly straightforward. It’s more or less across the river from the bus stop, through the village, and then around the corner with the church on your left. After about two-thirds of a mile, the path joins the jeep road, and after some more climbing, you reach the plateau, with the great peaks of the Caucasus spread out before you. The dominant Mt. 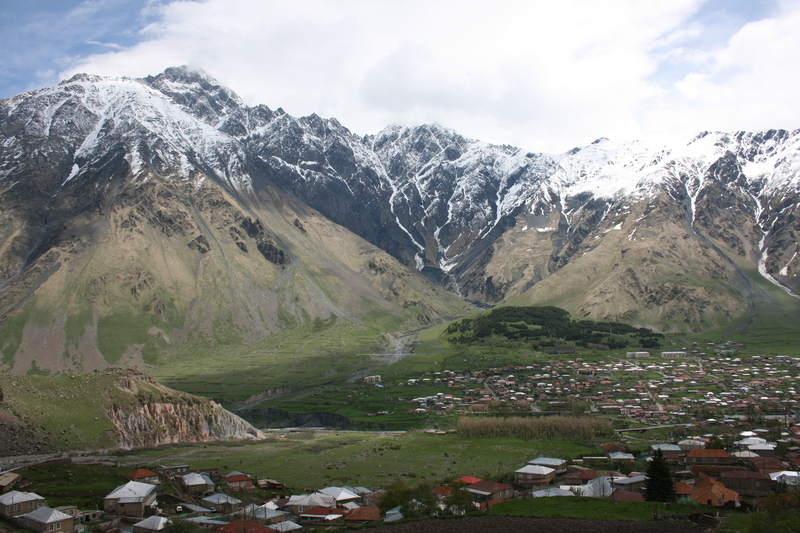 Kazbegi (5033 m, 16512′) showed herself very briefly, then disappeared for the rest of the day. The weather cleared for about 30 minutes as I explored the church and took in the view of the church, a nice carpet of wildflowers, and the still snowcapped peaks. From the town, it’s about 1500 feet in elevation gain in a couple of miles, a rather steep trail. You can also take a taxi, they’ll be waiting for you when the marshrutka arrives in town, but the walk is quite reasonable and takes around 50-60 minutes to walk up to the church. The path to the church is badly beaten by the number of cars that have blazed multiple tracks through the meadow, so walk up and save the environment in the process. 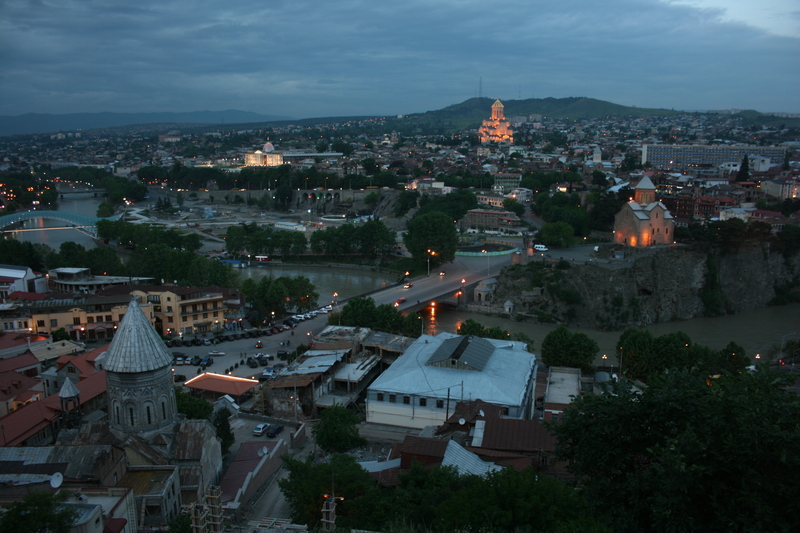 The marshrutkas run only a few times a day, so if you miss the last one back to Tbilisi, you’re stuck. The town is still apparently cut off from the outside world during the winter, and still experiences periodic power cuts, so the infrastructure is limited around these parts. A few miles to the north is the Russian border, a bit to the northeast is Chechnya. This is another hotly contested part of the world, with endless squabbling among the countries of the former Soviet Union. More on Georgia later, the food, drink, language, and sights are awesome, but just a few photos for now!